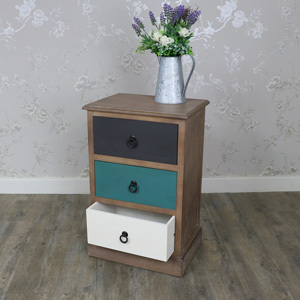 The Loft Living Range is an incredibly popular selection of rustic, wooden furniture with a driftwood effect finish, multi coloured painted drawer fronts and rounded wooden handles. 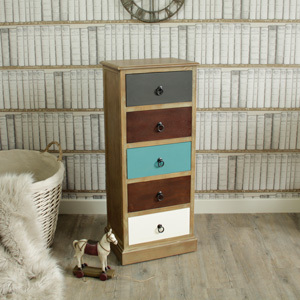 Items in this range include a 3 drawer side table, a 4 drawer side table, a 13 drawer tall boy and a large 12 drawer chest. These furniture pieces could be used as storage solutions in a bedroom, living room, hallway or office environment. 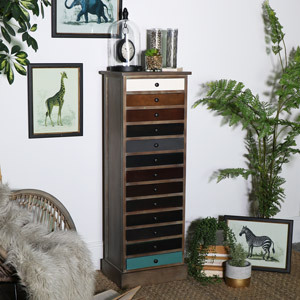 The Loft Living Range is ideal for those who love rustic, industrial, retro or mid-century modern style interior themes and want to add some quirky charm to their living space.